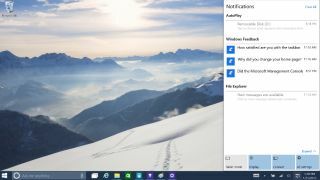 A new Windows 10 Technical Preview build is now rolling out to Windows Insiders. Microsoft announced that Build 10041 is now available to PC users who signed up for the Fast ring. "Like all of the previous preview builds this one comes with a collection of new functionality and bug fixes," said Gabriel Aul, Microsoft General Manager of the OSG Data and Fundamentals Team, in a statement. Build 10041 is the first Windows 10 Technical Preview update to participants of the Windows Insider program since late January. Microsoft recently announced that it will be pushing out more frequent updates to users in the Fast ring. If you're looking for stability rather than being among the first to try out new features, you should switch to the Slow ring. "10041 was built on Friday, and you're getting it less than 48hrs after the majority of our engineers in the Operating Systems Group receive it," Aul explained. For now, Build 10041 is available through Windows Update. "The build will only be available through Windows Update for systems already running a previous Windows 10 build," Aul said. "We still intend to release ISOs for builds that go to the Slow ring, but Fast ring builds will be direct downloads only." Microsoft is tweaking the visuals and under-the-hood experience with the latest build. Now, the Start experience has transparency. The All Apps list is easier to use for tablet owners and comes with a larger button. For Virtual Desktop users, there are now more features to streamline your workflow. Now, you can drag a window into a Virtual Desktop. "You can also drag a window to the "+" icon to both create a Virtual Desktop and move the window to it in single step," Aul said in a blog post. "We also now support a filtered taskbar. This means that only the running windows in a particular Virtual Desktop will show in the taskbar." In addition to English, Cortana will be supporting more languages. Cortana is now live for China, the UK, France, Italy, Germany, and Spain. It's also easier to switch and join networks with a new network fly-out from the taskbar. For photographers, the Photos app also got some big improvements. The app now shows images from OneDrive in the Live Tile image rotation. Additionally, Photos now supports RAW image files from many camera models. Tablet users who prefer to ink will also see a new text input canvas for better handwriting recognition. While there are plenty of attractive improvements to Build 10041, there are also a few known issues. Windows 10 is still in the technical preview stage and won't be fully ready until this summer. A few of the issues include not having the username and password boxes appear at login, some apps will not install or update due to licensing issue with the Store Beta, and the Mail, Calendar, and People app may be broken. If you're not ready to deal with some of the growing pains of being a tester in the Fast ring, you should switch to the Slow ring to get more stable builds. To switch to the Slow ring, click on the Start Menu from your Windows 10 system and choose PC Settings. You'll want to choose the Update and Recovery option, and navigate to Preview Builds. From there, you can choose to go with the Slow or Fast build. In addition to the technical preview program for Windows 10 for desktops, Microsoft also has a Windows 10 for phones preview. The company says that an update is forthcoming that will support additional phone models. "We're working hard to bring you a new build of Windows 10 for phones as well but we need a bit more time for that one, and we still expect to support additional phones when we release it," Aul said.